SomnoClinic® is the only clinic that is fully specialized in the treatment of snoring and apnea. At SomnoClinic® we use scientifically proven treatment methods. Meanwhile, we have helped more than 50,000 patients with proven results. What is the solution against snoring? 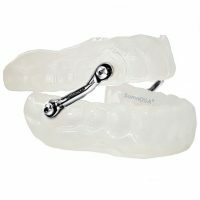 A custom made snoring mouthpiece stabilizes the soft palate and prevents the tongue from loweing into the pharynx. As a result, the airway is free and vibration (snoring) is prevented, making our treatment the most effective snoring treatment of the last 20 years. Since 1991 SomnoClinic® has been manufacturing snoring mouthpieces with individual attention. 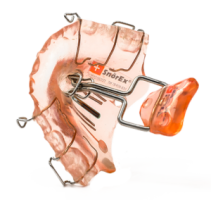 The development of the SnörEx snoring mouthpiece has taken place in collaboration with the universities of Ulm and Hannover. 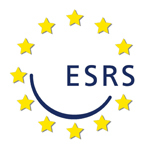 ENT doctors found very positive results during international studies in various sleep laboratories. 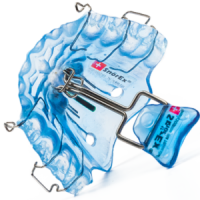 The patented SnörEx® has also been very suitable for treating patients with Obstructive Sleep Apnea Syndrome (OSAS) in clinical and sleep studies. A snoring mouthpiece must be personally adjusted and manufactured. During the free first consultation your problems will be discussed and a number of specific tests will be done to see if we can help you. If we determine we can help you, we will make prints of your upper and lower jaw. Our qualified specialists at our laboratory will make your custom made snoring mouthpiece. There is no surgery involved and you only wear your snoring mouthpiece at night. We've helped over 50,000 patients with proven results. SnörEx® is Europe's first snoring mouthpiece without side effects. The snoring mouthpieces are manufactured uniquely for you in our laboratory by qualified specialists. Without painful jaw joint complaints.